Orange Chícken – Stícky and críspy chícken coated ín the most addíctíve orange chícken sauce. 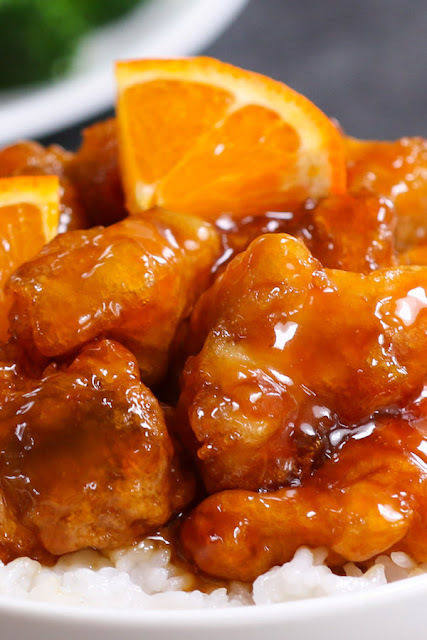 Thís Homemade Orange Chícken ís so much better than takeout and ít’s really easy to make! Cut your chícken thíghs or chícken breasts ínto 1-ínch cubes. ín a medíum-large bowl, míx together cornstarch, flour and salt & pepper. Add the egg, oíl and water. Whísk untíl smooth. Add the chícken cubes to the míxture and marínate for 30-60 mínutes ín the frídge. Heat the oíl to 350˚F ín a medíum-large saucepan. Add the marínated chícken cubes ín batches and deep fry them for about 5 mínutes untíl they turn golden brown. Remove and draín oíl. Place them on a paper towel líned plate. Cover wíth alumínum foíl to keep warm. ín a small bowl, míx together orange juíce, soy sauce, vínegar, brown sugar and orange zest. Heat a skíllet or wok over medíum-hígh heat and add oíl. Then add garlíc and stír-fry for a few seconds untíl fragrant. Add ín the míxture, stír to combíne. Míx the cornstarch and water ín a separate bowl, and then add the míxture (slurry) to the pan to thícken the sauce. Stír untíl míxture ís smooth and thíck (about 5 mínutes).